ZOMATO ' SOUTH AFRICA'S BEST FOOD AND RESTAURANT FINDER! Are you looking for the best way to search for, and even discover great new places to eat or order in? Zomato is the app for you then. With a beautifully designed interface, Zomato is an easy-to-use, social restaurant finder that lets you explore all the dining options in your city. Most of the young generation is using Zomato to make decisions when trying out new restaurants. You can choose between cafes, take-away’s, dining out, drinks and nightlife, desserts and bakes and then there is the Buzz category; that shows the trending places of the week, newly opened, romantic, kickass burgers and even hidden gems in your city. You get to browse through the menus, pictures of the restaurant and read reviews from other people’s experience. It will help you decide what is for dinner, lunch or even breakfast. The app even features Google-Maps to guide you to the restaurant and you can call an Uber- driver straight from the app. What sets Zomato apart from Google’s review is that they engage more with the user, you get to add your favourite places to a bookmark to browse through later. Zomato allows in-app bookings, search filters to narrow down results and find exactly what you are craving. 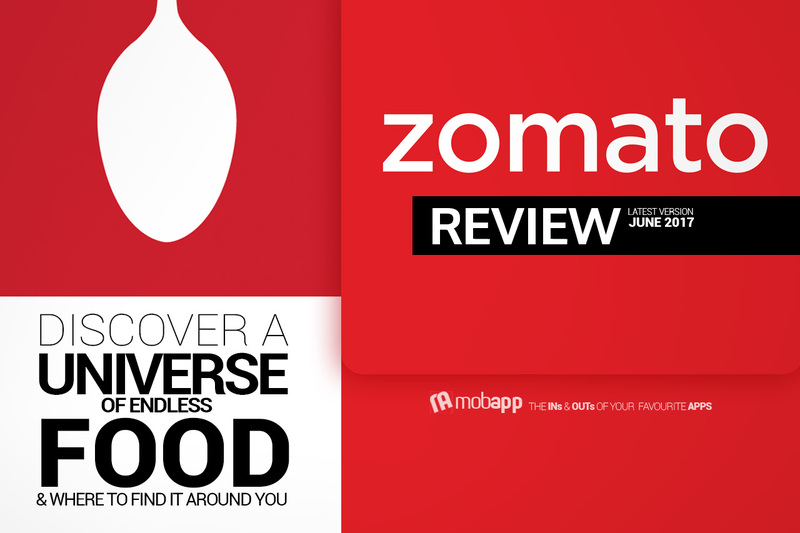 Every time you write a review you earn points, eventually Zomato start inviting ‘foodies’ to get a chance to interact with each other and try the expensive food. Zomato sends goodies to their top reviewers and you can get invited to new restaurant openings to try the food and give reviews to the app about your experience! Once you earn expert batch in any area by writing 10 reviews of restaurants in a particular neighbourhood, people can ask your opinion about the best restaurant that you can give your own opinion on. Zomato gives discounts to their users when you earn Connoisseur batch, and free meals and credits once you become a top reviewer. You can also get a percentage discount on your final bill when you order food through the app. You can sort reviews by the foodies you follow or the food blogs to see what they have to say about the place that you consider to go to. The app is also SEO friendly, be it different pages, URL or meta tags, everything is planned, keeping search results in mind. You can activate notifications on your Zomato app to know when there is an activity on your reviews, someone follows you and even when your friends join Zomato. Also be sure to activate the weekly newsletter on your portfolio to get the latest trends in your city. So download Zomato now and consider becoming a food blogger, I know I will.